some instances even armies of flies in the house and especially the kitchen. Did you ever wonder why they decided to come into your garden or kitchen? Flies are attracted by smells of organic matter which they like to feed on and lay their eggs in. They can smell raw meet from a distance of 7km and will as well love to visit dog or cat poop in your backyard, fruit waste in your kitchen or placed on a compost heap or a layer of fresh horse manure that you have added to your garden to improve your soil fertility and structure. The best way to fly control your property is to avoid attracting them in the first place. To keep them away, keep your living space clean of any old food waste, spilled or in pots or plates. Clear away any pet waste or fresh organic waste in your backyard or garden. The less your environment smells of any organic matter the fewer flies it will attract. is to use home made fly traps to catch the insects. But what are you supposed to do once your home and garden are infested with flies? Punching holes into the bottom part of the fly trap. But if you struggle to get rid of the flies and you want to avoid purchasing costly commercial products consider building simple fly traps. They will attract and catch loads and loads of flies for you. B﻿elow you will find simple instructions to build functional low cost fly traps. 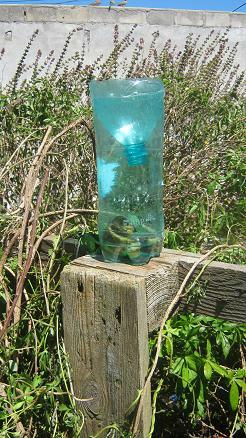 A finished fly trap in the garden. 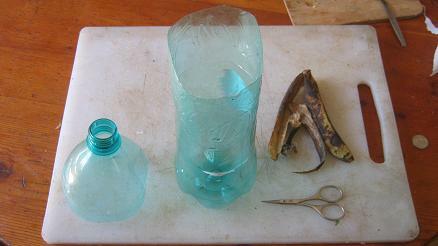 How to build a low cost fly trap. Throw a small piece of dog poop into the empty bottle and add some water to it. I know it doesn't sound very nice but hey it really works. 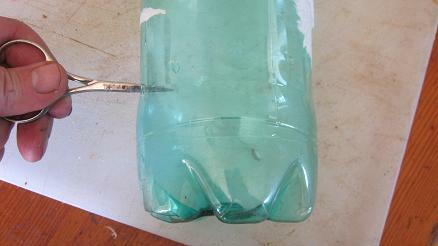 Place the cut off top peace upside down into the opening at the top of the bottle base. It should look like a funnel now. Make sure that it fits tight and no gaps are left open. Attach the funnel top to the bottle base with some clear sticky tape. Place the trap a few meters away from the place where most flies are on an elevated place. Maybe the balcony a tree in the garden, the garage or on a shelf!? The flies will get attracted to the traps and crawl into the funnel opening at the top. Most of them will not find the way out again. You should catch most of the flies that have been in your home or garden within 48 hours. Once your traps are full either release them somewhere else or wait till they are dead and than add some to your compost heap or feed them to your worms in a worm farm. have caught the remaining ones. If you want to get rid of fruit flies build the same kind of trap just leave away the dog poop and only use the banana skins! Good luck on your way to fly control your home! Return from "Fly control" to the "Home Page." A similar approach to get rid of fruit flies! How to build a home made worm farm!